As always, we had Aaron Hockley photographed the event. Those PIE Demo Day photos can be found on Flickr and are licensed under Creative Commons with attribution. To stay up to date with the latest news from PIE, please consider subscribing to our newsletter or follow us on social media. It’s hard to believe that it’s been a little more than four years since the last PIE Demo Day. Time, as they tend to say, does indeed fly. During that hiatus, we’ve managed to accomplish quite a bit. Quietly, mind you. Out of the limelight of the stage. But we’ve still been hard at work. Accomplishing stuff. Still, we’d be lying if we didn’t admit to missing PIE Demo Days. Quite a bit. Not for all of the stressful preparation. Or the seemingly never-ending pitch practice and critiques. Or the nerve jangling day-of delivery. Honestly, we don’t miss that all that much. What we do miss about PIE Demo Days, however, is that they consistently served as a brief moment of celebration where we could come together to embrace and support some of the awesome founders building amazing companies in our midst. So that we could all gather together — new founders and serial entrepreneurs, established companies and startups, would-be entrepreneurs and their soon-to-be mentors — as a community. So, with that in mind, we’re happy to announce that — 100 days from today — PIE will be hosting PIE Demo Day 2019 on, appropriately enough, March 14, 2019. Pi Day. 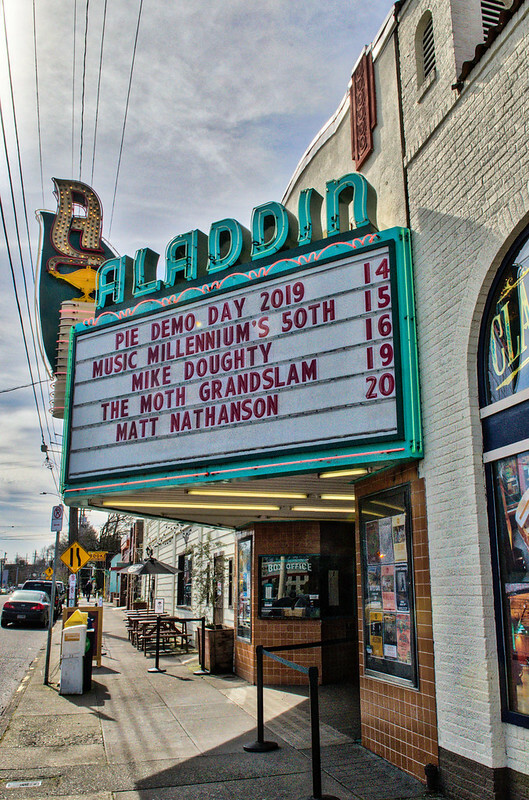 This time around, we’ll be taking the stage at the historic Aladdin Theater in southeast Portland, a stone’s throw from the Dairy Building where the latest class of PIE spent much of 2018. Best of all, the Aladdin is our largest venue yet. Meaning that we can bring together more of the community, in person, than we’ve ever had the opportunity to do before. As always, the event is free of charge, but space is limited. Seats are general admission. If you choose to make a donation to PIE, that will give you access to a block of reserved seats, front and center. If you’re worried about figuring out childcare so that you can attend? Stop worrying. Childcare will be provided, free of charge to attendees. We’ve arranged for our go-to photographer, Hockley Photography, to capture the event for posterity. And, as in previous years, we will be partnering with Blaze Streaming Media to ensure that family and friends from around the world can tune into the event from the comfort of their Web browser if they’re not able to attend in person. And, of course, it wouldn’t be a PIE Demo Day if we didn’t have a few surprises to reveal. Please grab a ticket and block the time on your calendar. This event usually sells out fairly quickly. And we’re sincerely hoping you can join us. Because we’re looking forward to sharing all of our amazing companies and awesome founders with you. For more information or to RSVP, visit PIE Demo Day 2019. We’ve had the pleasure of partnering with any number of corporations throughout our experiments. Now, we’re partnering with Portland’s largest law firm to ensure that startups in our community have efficient access to mentorship from legal experts. This collaboration will allow PIE to offer its startups resources and mentorship opportunities with experienced Stoel Rives attorneys who focus their practices on working with emerging companies. The partnership marks another step in Stoel Rives’ ongoing efforts to support the entrepreneurial ecosystem in Portland. Originally founded as a collaboration between Portland based creative agency Wieden+Kennedy and the Portland startup community, PIE has continued to partner with private industry to support its ongoing operations. Since the venture was founded in 2009, financial and in-kind support has been provided by leading companies including Autodesk, CENTRL Office, Coca-Cola, Daimler, Environments, Google, Intel, Intrinsic Ventures, Nike, Target, Uncorked Studios, and W+K. Through the partnership, the attorneys in Stoel Rives’ Emerging Companies practice group will provide practical and thorough advice to a diverse range of companies that are forming, financing, hiring, creating and protecting innovations, as well as resolving disputes that may arise along the way. The team brings a combination of legal knowledge, entrepreneurial thinking and understanding of the financial markets as they help entrepreneurs navigate from startup through sale or public offering. While PIE has amassed nearly a decade of experience in assisting and accelerating early stage startups, the bulk of that experimentation has been with software companies. So when we embarked on a new project to apply PIE’s startup accelerator methodology to companies that manufacture physical objects, we wanted to be sure we knew how those types of companies would make use of the physical space we provide. We understand how much space software companies use… but how much space do startups who make things use? In an effort to answer that question, we did what we usually do. We began experimenting. We’ve been quietly beta testing our PIE Shop space with a few different physical object startups, who were specifically selected from early applicants to help test drive the space and help us gain a better understanding of their needs and use. Given that the experiment seems to be going well, we felt it appropriate to share those companies with you, as well. Bip: Bip is a small format connected device designed to be worn by residents of assisted living facilities as a means of opening lines of communication among residents, staff, and family, and providing critical data points that inform other assisted living management solutions. CMDSense: CMDSense uses a variety of connected devices and other tools to gather outdoor and indoor data in cities in order to help transform cities into places that benefit every urban citizen. Dorsum: Carrying unsupported weight puts strain on the back, increasing the risk for injury. Dorsum has designed and are developing the AdaptiveSpine™, a spinal exoskeleton and supportive device that transfers weight and stress to the hips. Foundry Collaborative: The team who built the Adidas connected ball has spun off from the apparel company to continue to innovate on the technology they created. They will serve as both a PIE Shop company and mentors in residence for the other companies in the space. And we’re also happy to host a couple of community pursuits that help make Portland a better place. PDX Women in Tech: Established in 2012, we are a community-based non-profit organization. Our purpose is to strengthen the Portland women in tech community by offering: educational programs, partnerships, mentorships, resources and opportunities. Portland IQ: A public private partnership formed when Portland’s rapidly maturing higher-ed anchor institutions recognized that shared goals, overlapping constituencies, close proximity, increasing community investment, and complementary real-estate development projects presented a rare opportunity for collaboration — collaboration that would provide exponentially more value as a combined effort than it would as individual projects. After beta testing the space, we are confident that we can likely fit one or two more companies into the space. All companies selected to participate receive free office space, access to the Autodesk desktop manufacturing facility, free use of Autodesk’s entire suite of software, and the opportunity to take part in the PIE program of mentorship and acceleration. So if you’re interested in applying to be one of those companies, please complete the PIE Shop application. Applications will close September 16, 2018, at 11:59PM Pacific Time. NOTE: If you have already applied, you do not need to resubmit your application. However, you are more than welcome to submit, again. Today, we’re announcing our fifth startup accelerator class — after a four year hiatus —through a program funded in part by Prosper Portland and its Inclusive Business Resource Network. The program, helmed by PIE program manager Chevonne James, is housed in The Dairy Building in the central eastside industrial district at the southeast corner of the Portland IQ, through a collaboration with Intrinsic Ventures. The latest version of the ongoing PIE experiment in collaboration among the Portland startup community and other established organizations—like corporations, government, and educational institutions—refactors its former model for early stage startups, moving away from the typical “three months and out” format to embrace a rolling cohort model where mentored companies grow up and out of the space as quickly or as slowly as needed. In addition, through its partnership with Prosper Portland, PIE has increased its efforts to attract founders who identify as women and/or people of color in an effort to better represent the wealth of entrepreneurial activity in the Portland community. Two of the companies in the current cohort, Additive Care and AllGo, are graduates of the TiE XL Bootcamp, which is also part of the Inclusive Business Resource Network. From tech startups to neighborhood retail, small businesses are vital to the city’s economy. The Inclusive Business Resource Network is a citywide program that brings multiple services for small business into a single network to provide greater efficiencies and cross-functional innovation. The Network leverages the power of partnership to increase the success of underrepresented entrepreneurs. Through focused resources, collaboration and client-centered services the Network seeks to drastically shift outcomes for business owners of color, immigrants, women founders, and other underrepresented minorities. Approximately 600 businesses are served through the Network each year, and 400 businesses – 65 percent owned by women and 75 percent owned by people of color – receive long-term support (30+ advising hours a year). Intrinsic Ventures and its affiliate companies acquire and develop commercial real estate in transit-oriented, urban areas, and endeavor to create public benefits in unique locations. Our goal is to invest in the future of urban areas and to establish projects in pedestrian districts where alternative forms of transportation, like buses, bicycles and trains, are easily accessible. We create some measure of public benefit through our efforts in conjunction with a viable investment. Our buildings—which include The Dairy Building—are vital, mixed-use hubs that thrive because their location and close proximity to other, minor-commercial properties creates a draw for local, repeat customers. By developing clusters of contiguous properties, we create a sense of community amongst our multi-tenant buildings. Developing and preserving historic buildings on tree lined sidewalks, establishing thriving communities in open public spaces and job creation are at the core of Intrinsic’s philosophy. PIE is a 501(c)3 nonprofit organization through its fiscal sponsor, Built Oregon. PIE and Built Oregon are founding partners of the Portland IQ. PIE 2018: What experiments are we cooking up next? Looking back at 2017, PIE managed to accomplish quite a bit. Even if we didn’t feel like we did. In fact, we only realized what sort of progress we had made because we had taken the time to publish a list of objectives for 2017, and that gave us a yardstick to measure our accomplishments. With that list as a reference, we had to admit that we’d made progress. Which is probably why people make lists. Bear in mind, we’d made mistakes, too. And failed. But that’s all good in our book. In that same vein, we now want to have a list to consult in 2019, in case we’re burdened with a similar sense of un-accomplishment. So we thought it might be beneficial to share some insights on what PIE is working to accomplish in 2018. Besides, it helps keep us honest. About both successes and failures. Let’s be honest. Talking about the past is a lot easier than guessing about the future. Regardless of how sound your strategic thinking. All we know for certain is that we’ll continue experimenting. Because that’s what we’re best at doing. And it’s in our name. With that in mind, here are some of the areas where the PIE team will be intentionally focusing our time and energy this year. NOTE: In the spirit of brevity, we’re just going to lightly touch on some of our objectives. Not go into great depth. Because we recognize that each one of these topics deserves a post of its own. And those will be forthcoming. But that desire to provide more detail has simply been preventing us from getting this post out the door. So we’ll work to flesh out each of these topics over the coming weeks. Build an hors d’oeuvre section to the PIE Cookbook. Following a successful Kickstarter campaign in 2016, PIE completed the initial version of the PIE Cookbook in 2017. It’s become exceedingly obvious, however, that consuming that entire book is a difficult first step for many folks. It’s way too daunting. That, of course, was not the intent. The intent was to demystify accelerators and to make the concept more accessible. But that clearly requires something that is easier to consume. So we’re going to create something more accessible that helps you quickly determine if you’re ready to start building the accelerator of your dreams before you have to dive headlong into a ton of content. Experiment with a nonprofit model for PIE. We’ve tried for profit. In fact, we’ve experimented with that model for nearly a decade. But there’s one small problem. PIE is not driven or motivated by profit. We’re driven by purpose. So it’s time for something new. Becoming a nonprofit might not be the right thing to do, but it’s an experiment worth pursuing. If only to help others understand the pros and cons. Build an accelerator that is more authentic for our startup community. A lot of what PIE has done in the past has been based on prevailing and accepted accelerator models. And to be honest, those models have both structure and artifice that only works within certain environments or with substantial resources and partnerships. We don’t have those same resources. And Portland isn’t the same kind of environment. So we’re reimagining what a Portland-flavored startup accelerator could and should look like. We’ve already got some good ideas about what that might mean. And we’re looking forward to putting those ideas into action in 2018. Return to building better founders. One of PIE’s founding tenets was “Build better founders.” To us, that meant that we were more interested in helping people than companies. We didn’t care if the companies succeeded or failed. We cared that everyone in the PIE family—founders, mentors, investors, partners, and staff—would be better off for having participated. Our shortcoming? We only focused on the business aspects of making founders better. In hindsight, this was a mistake. So this year, we’re looking to focus holistically on building better founders. From mental health to community engagement to family support, PIE is going to build the best founders we can. Begin building better staff. One of the biggest mistakes I’ve made with PIE in the past is not providing effective and clear paths for the staff to move into leadership positions within PIE. While we’ve provided opportunities for professional growth and enabled staff to propose and execute different experiments, we’ve failed to give them upward mobility. Admittedly, part of this was due to the fact that I didn’t even really understand my role. But whatever the case, this was on me. To make the model sustainable, that needs to change. This year, we are likely to have several opportunities to provide upward mobility for PIE staff. And as we learn how that works, I hope that we can add guidance to the PIE Cookbook about how to more effectively engage and enable accelerator staff to grow into accelerator leaders. Expand the PIE family with a new class of startups. Once we secure physical space, we’re going to need some activity in that space. And some people. And startups. I mean, if we’re rebooting this whole thing, let’s reboot it. So if you’re building a startup and you think PIE could be helpful, be on the lookout for a whole new PIE application period opening this year. That sounds like a lot. But it sounded like a lot last year, too. And we managed to complete all but one of those objectives. So we’re tentatively optimistic that we can get it done. Will we succeed? Who knows? But we’ll experiment. And fail. And maybe succeed. And we’re hoping you’ll continue to stay tuned as we do. We’ve been taking some time to look back at 2017, as most of us are wont to do this time of year. And now seemed like an appropriate time to share some of these reflections. Partially because it was six years ago last week that PIE staged our very first Demo Day, January 17, 2012. And in addition to what we set out to do, we also managed to hire a new program manager; not only support but strengthen our partnerships with Built Oregon, CENTRL Office, and Prosper Portland; organize another successful Portland Startup Week; proudly watch PIE alums like Cloudability, dotdotdash, Droplr, Lytics, Outdoor Project, Supportland, Switchboard, Uncorked Studios, and more have a strong year; and took equal pride as members of the PIE family chased new pursuits like Reflect and Torch. Looking back, it seemed like it was a pretty productive year. So I had to keep asking myself why it felt so frustrating. Why was I “surprised” that we accomplished these things? And why was it that I still felt like we didn’t get anything done? And then it dawned on me. It was because I didn’t feel like we had an impact. We accomplished tasks. We nudged projects forward. We kept a few things going. But we didn’t create change. We expanded our community but we didn’t strengthen our community. We didn’t push the experiment forward. So it didn’t feel very good. It was a year of frustration, a year of questions, and year of reboots. It was a rebuilding year at best. And a gap year at worst. But that cloud, like many, has a silver lining. The year of frustration and cynicism and disappointment also provided vantage. Enabling us to step back and to objectively reassess what it was we were doing with PIE. It gave us the opportunity to truly question what we were hoping to accomplish. And why were doing it. And what was working. Now, we’ve realized that the main experiment we were pursuing in 2017 was a failure. Trying to work behind the scenes with other accelerator programs—a move we assumed would allow PIE to scale its impact most efficiently while providing a revenue stream for the organization—was a flop. That wasn’t what the Portland startup community needed. That wasn’t what founders needed. That wasn’t a sustainable business model. And that wasn’t a viable means of expanding the sort of impact we had hoped to provide. Truth be told, it wasn’t even an effective means of providing the same level of impact we had managed to provide in previous years. At best, we had gone backwards. At worst, we had become completely irrelevant. That said, like all experiments, it was good to pursue it. To test and to learn. But we’re also completely willing to admit that the experiment was a failed one. Like many experiments we’ve run over nearly a decade of PIE. To make matters even worse, we recognized telltale signs of bonds weakening in our community. We found fragmentation and confusion. And we found folks feeling detached and disconnected. In reality, we found our community was suffering from many of the same issues that had originally inspired us to start PIE in the first place. Only with an exponentially larger group of people. And that, to us, seemed like an opportunity. So we hit the brakes and began listening again. Listening for what the community needed. Listening for what startups needed. And listening for what PIE could do to have a meaningful and significant impact in our community. As such, much of 2017 was taken up with rethinking and reinventing PIE and then talking with anyone who would listen. Revising. And then talking with everyone again. Listening to their suggestions and critiques. Revising… You get the picture. We’ve torn it all down. Rethought everything. And all of that—all of that nudging things forward and rethinking everything and listening listening listening—has us prepared to dive headlong in 2018. What we’ve come up with is a new experiment. With a new version of PIE that we hope will be a better match for the actual needs of the Portland startup community. And one that has a demonstrable, tangible, and measurable impact on both Portland and PIE, itself, this year. So what does PIE 2018 look like? We’re glad you asked. And we’re looking forward to sharing some of those details in our next post. We always talk about PIE being “an ongoing experiment.” But what exactly does that mean? Well, as we were preparing to embark on a whole new series of experiments, we took a few minutes to diagram the experiments we’ve already tried, to date. It helped us visualize our history. So we thought it might be helpful to share.